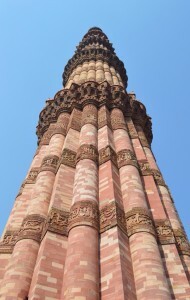 The Minar at Qutb Complex. After a few hours of sleep, I wake up about 6:30am India time. Down to breakfast around 8am in the hotel restaurant where they are serving a buffet consisting of India, American, Japanese and Chinese food. We decide that we want to go sightseeing, so a car and a route are arranged. We meet our driver, Sunjive, who is very nice and, thankfully, a quite competent and not terribly aggressive driver. 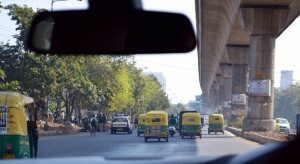 We get our first look at Delhi in the daylight. It is still fairly early on a weekend day, but already the day is bustling. There are so many people on every kind of conveyance possible. The men are all relatively conservatively dressed, but the clothing on the women burst with color, no matter what their status. Delhi is a city with 22 million people and it shows in her streets. I have been warned about the evident poverty, about panhandlers approaching cars and insistently trying to get your attention. It happens many times on this trip; I resolutely avert my eyes. The danger of giving to one person is that you will be swarmed by all the others, wanting a piece of what you have. 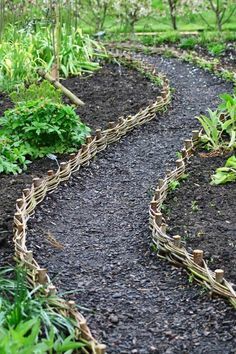 There are piles of garbage on the site of road, with people and animals (cows, dogs or goats) rooting through the debris for something edible or salvagable. Just as frequently, I see a person sweeping a bit of sidewalk with a homemade broom made of twigs. Leisurely driving in Delhi. The yellow and green vehicles are tuk tuks. They are everywhere. The city speeds by as our driver expertly avoids what seems like a thousand narrow misses. I am beginning to see a method in the madness. My companions are a little bit freaked out by the multiple near misses, so at some point, I move to the front seat as it doesn’t seem to bother me as much. Seemingly at random, people are messing about with bricks, either salvaging them or building short walls between lanes traveling in the opposite direction. The stones and bricks are scattered in the driving lane. Sunjive honks and jockeys his way around them. Anytime we have to slow down, people on motorcycles or bicycles or the ubiquitous tuk tuks (auto rickshaws) squeeze passed us, filling up any available space. We are four vehicles abreast on a two lane road. If we come to a complete stop, pedestrians flood onto the street, hawking their wares, tenaciously knocking on windows to get you to look at them. At one point my companion forgets herself when she sees a couple of young boys, perhaps eight or ten, with curling mustaches drawn on their faces in ink, weaving their way between the vehicles. She half raises her camera before I can remind her not to take a picture. They see and rush over, knocking on the window and begging her for money. It is the longest light stop, punctuated with the persistent stacatto knocking of the boy’s knuckles. At another light, we look over to see a toddler, perhaps two and not very steady on his feet, bobbing between cars and holding a brass cup above his head at each window. 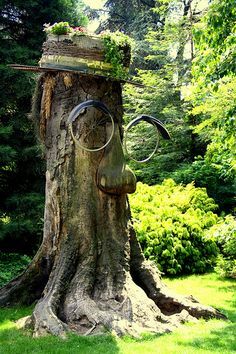 We don’t see an adult anywhere. This was perhaps the hardest thing to witness and feel helpless in our inability to respond. The minar at its full height. 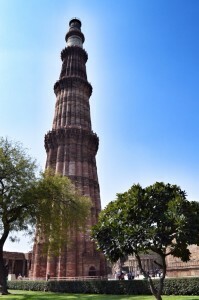 Eventually, we get to our first stop at the Qutb (pronounced Qutab) Minar complex. Sunjive lets us out by the ticket booth, where we are escorted by an official-like person up to the front of the line. We are “high status foreigners” who pay a premium and therefore lines don’t seem to apply to us. I figure out why when I see the sign that Indians pay 10 rupees and we have to pay 250. That’s a little under $5. I don’t mind. We get our tickets and cross the street to the complex, somehow managing to avoid being run over by tourist buses or taxis. There is a short queue where someone takes our ticket and we enter the site. The complex is vast, the landscape dominated by the 73 meter minaret built in the 13th century. There are many other ancient buildings on the grounds. I am fascinated by colonnades, by the rich color of the red sandstone and by the carved decorative panels on the structures. People fill the ground. It is clear that it is a day to be out enjoying the sun and the sites with your family. We walk around the site, snapping pictures. Our time is short. My companions remind me that we have many other sites to visit today. I wanted to stay much longer. Our next stop is the Lotus Temple. It is a Baha’i house of worship completed in 1986, something I didn’t know until we got there or I might have suggested skipping this one. 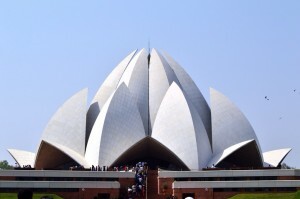 The Baha'i lotus temple in Delhi. Again, we are dropped off at the front gate of the site, our driver nonchalantly blocking traffic for his “high status foreigners”. The line is short; the site is free. We walk around a bit, corralled onto the wide sidewalks. 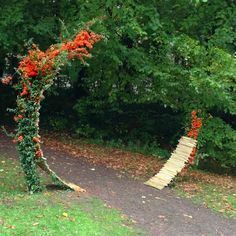 The grass, flowers and trees are all forbidden. When we near the temple, a guard stops us, handing us a bag and pointing to our feet. Eventually, we understand that we are to remove our shoes before we can go any closer. Stuffing our shoes into the bag, and with bag in hand we continue walking until again we are redircted down a narrow flight of stairs leading to a room under the sidewalk where they exchange our bag of shoes for a numbered wooden token. I go barefoot, the others leave on their socks. The temple is beautiful but the line to enter is long. We decide that we aren’t really all that interested in seeing the inside. When we get closer, we see that beneath and surrounding the temple are turquoise reflecting pools, Indian families taking their ease in the shade and cool of the area. On the backside of the temple, we press our noses to the glass, peering into the dark interior. It is a domed room, benches formed in rows in a semi-circle. At the front is a podium and a microphone. We could be anywhere. It is disappointing. Beautiful, but without the sense of history for which we are looking. 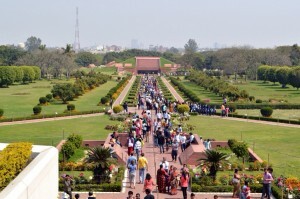 Looking from the steps of the Lotus Temple toward the entrance. We weave our way back through the lines of waiting people, exchange our tokens for shoes and head back to the front where we call Sunjive to pick us up to take us on our next. Our third stop is Humayan’s Tomb. I’ll tell you about that in Part 2. 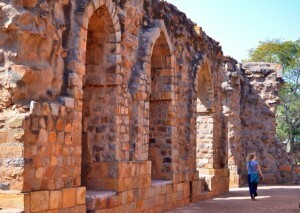 Ancient arches on the far side of the Qutb complex. One Response to First day in Delhi, part 1. This sounds like a beautiful yet heartbreaking place to visit. I look forward to hearing about Humayan’s tomb.